This entry was posted in Inspirations and tagged art, nemo, silliness by Aria Nadii. Bookmark the permalink. You do have the best icons. Ha! Bongo likes to chew on my brushes also. So adorable! 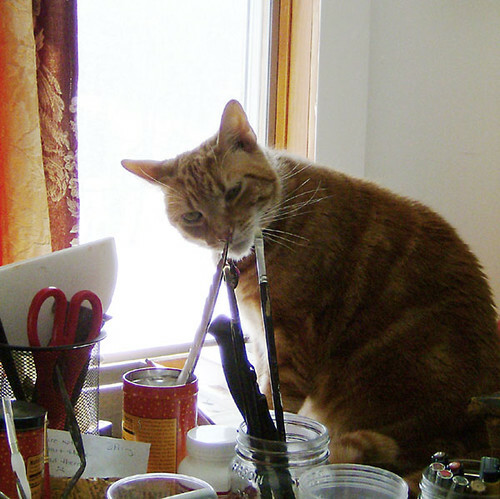 Kitties love brushes and pens and pencils, the dirtier, the better. Phoenix also loves romaine lettuce cores (like catnip!) and plastic. I love your orange kitty! I love him too but he’s a crazy little guy. He will eat or drink the most horrible things. Nemo eats plastic and my spider plants and he loves chives but he hates lettuce. Is he rubbing them on his cheek or his gums? Nemo likes to have his gums rubbed and rubs them against everything. He does that. How did you know? At this moment, he whacking all the babies off of one of my spiders plants. He’ll probably eat those too.